On November 13th, 2016 the LLG family proudly celebrated our 50th anniversary. 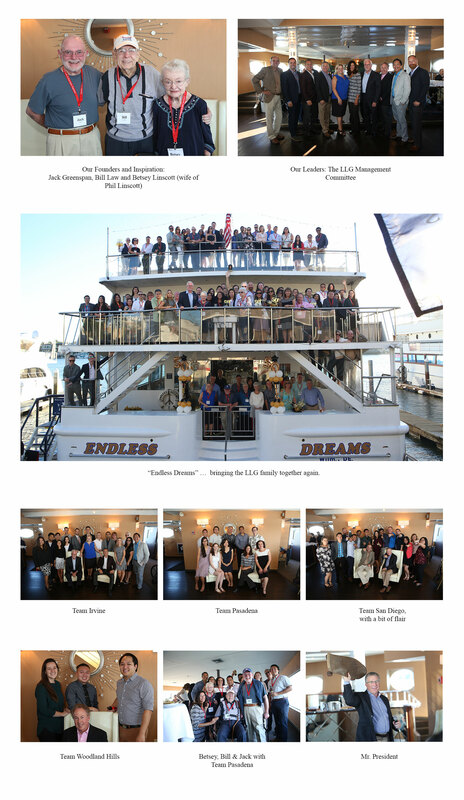 The event was held aboard the Hornblower Endless Dreams in Newport Harbor, and featured three of our founders; Betsey Linscott (wife of Phil Linscott), Bill Law and Jack Greenspan. It is rare for a company to maintain its original private ownership for five decades, and rarer still for the founders to be able to see how their legacy had developed. This was the first time that Betsey, Bill and Jack have all been together as a group in nearly 30 years, and it afforded our current leadership and staff the pleasure and honor of meeting them to celebrate this incredible milestone as a group. The cruise provided a picturesque venue for socializing, dining, and viewing an extensive slide show featuring photos of company events and staff members old and new. There were plenty of warm memories and laughs to be had of yesteryear fashions (thank you, 1970’s), and we were blessed with perfect weather for a perfect party. Enjoy the celebration photos!